“Hi! My name is Helen, and I am a student at Derby University. I am starting an MRes (Master of Research) degree in Forensic Science in the new academic year, and I am working towards a future career in Forensic Entomology. 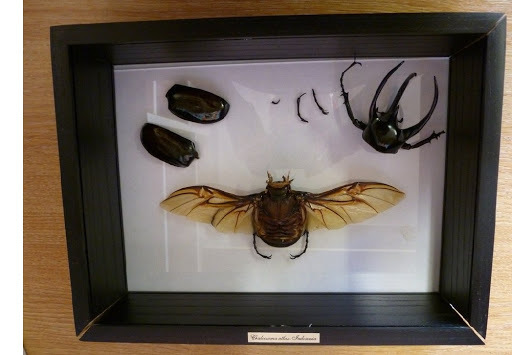 In July this year, I undertook two weeks of volunteering in the entomology department of the OUMNH. I was really excited to see another side of entomology, and to be able to get some more practical experience in the field. I have been interested in museum work for some time, so I was pleased to find that I really enjoyed the owrk that the team do. When I arrived, I was given a tour of hte department and then given a drawer full of mixed specimens to sort to order level. It was really good practice for being able to trecognise the different orders, and I enjoyed looking at all the different specimens. 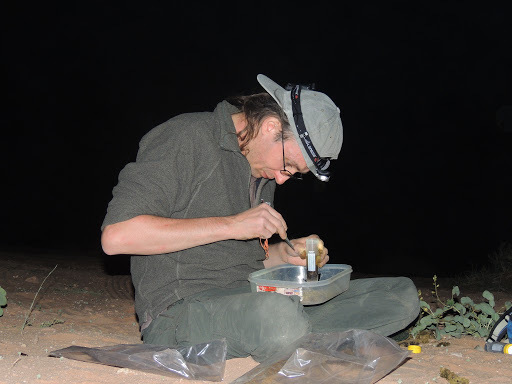 Later, I got some extra practice at recognising orders when I sorted some specimens collected in Bolivia. In my first week, I attended an IPM (Intergrated Pest Management) conference, which helped me learn about the problems with pests in museums, and the methods which are avaliable to help prevent important collections from ebing eaten by hungry critters. 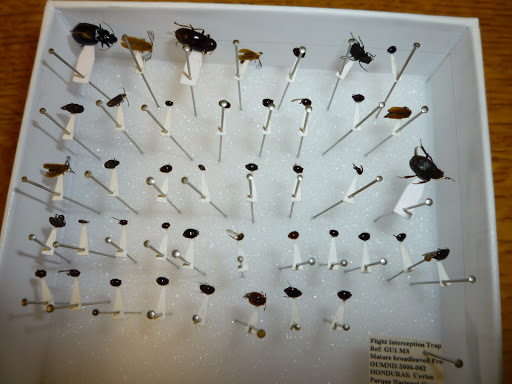 I also got to develop my skills in identifying insects using keys, and I had a go at point mounting some specimens – a technique used to moutn very small insects for identification and display purposes. In my second week of volunteering, I was able to practice the new skills I had learned in my first week as well as gaining some nrw ones. I had a go at direct pinning some specimens and added some new labels to part of the collection which had belonged to W.J. Burchell. I also uised the auto-montage to create some amazingly detailed photographs. 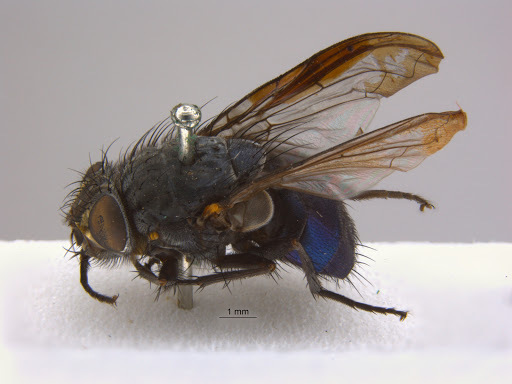 An auto-montage photograph of Calliphora vicinia. The department would like to thank Helen for all her hard work and the for the contributions she made during her two weeks with us. 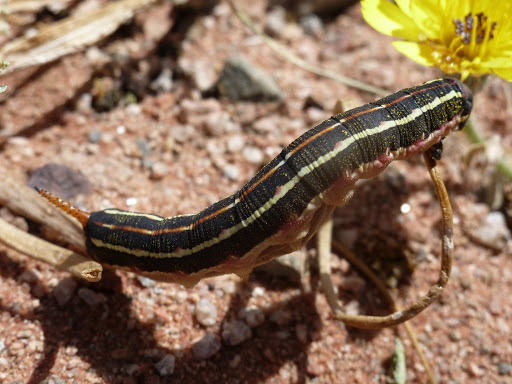 A hawkmoth (Sphingidae) caterpillar. Note the spine on its rear end. 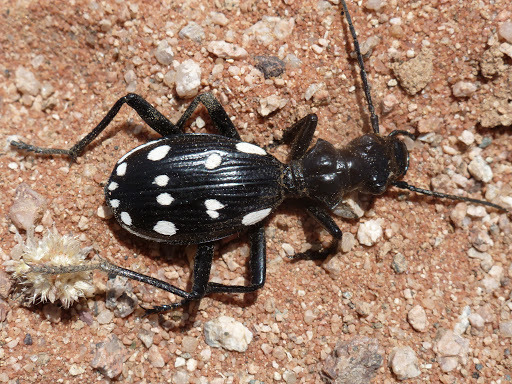 Species of the genus Anthia are some of the largest of the Carabidae. 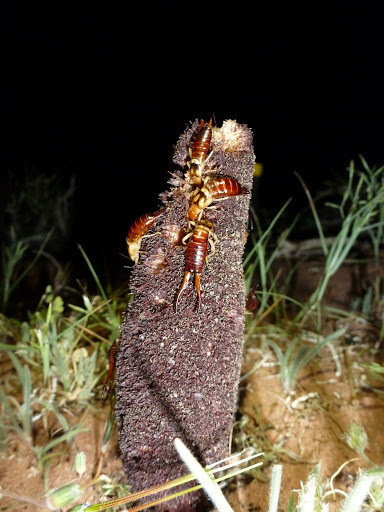 All of them are heavily armoured and have strong, sharp mandibles which they use to catch and crush their prey with. The species are usually black with either white or creamy-yellow spots or stripes on them. Many of them also have descriptive species name. With the above species ‘duodecimguttata‘ translates roughly as ’12-spot’. 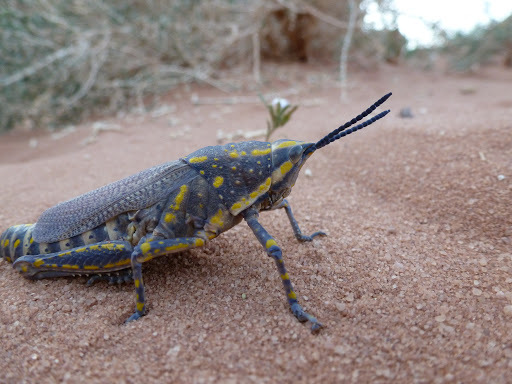 A desert locust, Schistocerca gregaria. Orthoptera: Acrididae. Darren, camel trekking. 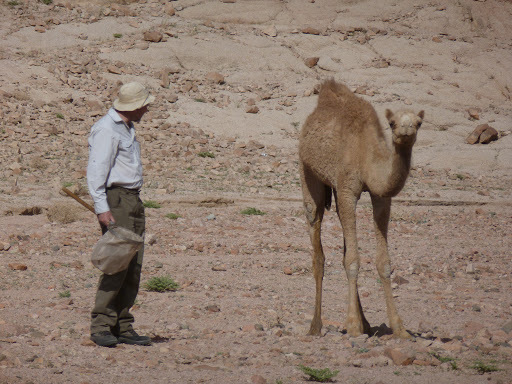 Note the slightly uncertain look on his face and the slightly wry one of the face of the camel. 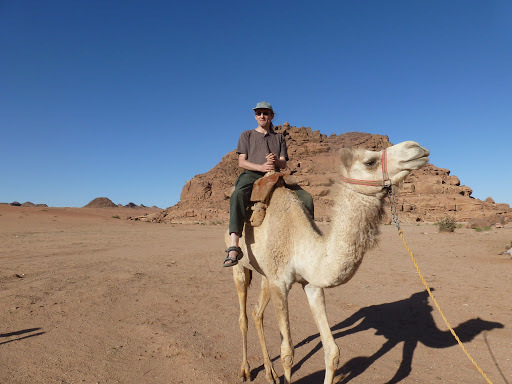 Darren attested to the speediness of this particular camel, something that it seemed particularly proud of and eager to demonstrate at any available opportunity. 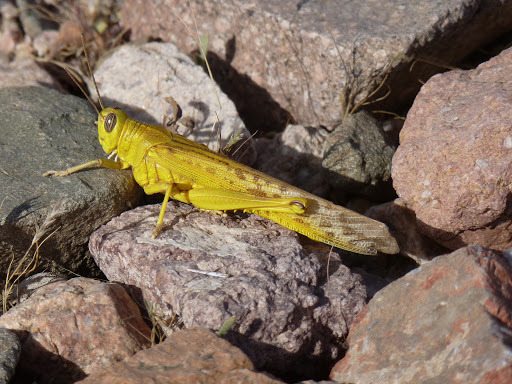 Orthoptera: Acrididae, Poekilocerus bufonius (Klug, 1832), a possible new species record for this area of Saudi Arabia. The grasshopper above can be identified as female by looking at the length of the wings. In this instance the end of the abdomen (tip of its bottom) pokes out by an easily visible amount from under its wings. Male grasshoppers of this species have wings that completely cover the abdomen. 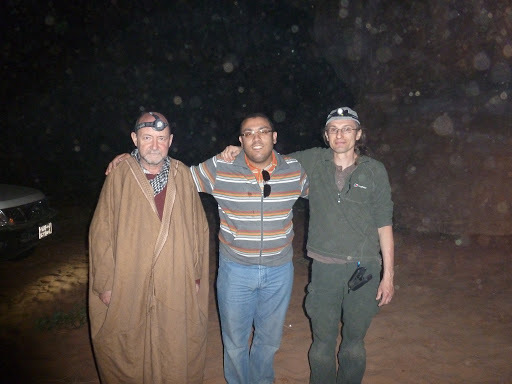 Darren and Mike with , Haitham Badrawy, one of the lecturers at Tabuk University. 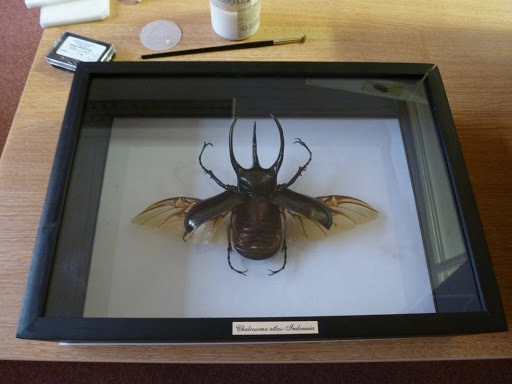 We recently had an enquiry asking for advice on how to fix an entomological display specimen and after some discussion, it was decided that it would be best if the specimen be bought into the collection to be professionally repaired. 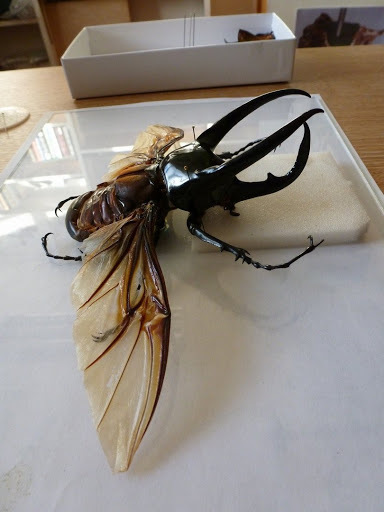 The specimen was that of a scarab beetle, Chalcosoma atlas (Rhinoceros or Atlas beetle) a relatively large species found in South-east Asia. As specimen repair is something that we have to undertake on almost a daily basis and one of the seemingly more baffling aspects of our job (not many people get to say that they glue insects back together for a living after all) we thought it might be interesting to show something of the hands on side of our work. We undertake repairs on a whole variety of dried insects and arachnids, many of which are of historical value. Damage can occur either through pest or mechanical action or from initial poor specimen preparation. The first image shows the scarab as it was when it arrived. Along with the obvious destruction, there was also severe pest damage, caused by the Flour beetle, Tribolium castaneum. This meant that before any restoration could be done, the specimen needed to be frozen to kill any remaining pests. It was bagged up and frozen at -30°C for six days. Once it was un-bagged and removed from the frame, it was vacuumed thoroughly to remove all the dust and debris caused by the pests. A paint brush was used to gently clean the specimen. The restoration had to be done in-situ as the specimen was glued to the glass to with some heavy duty glue and could not be removed. 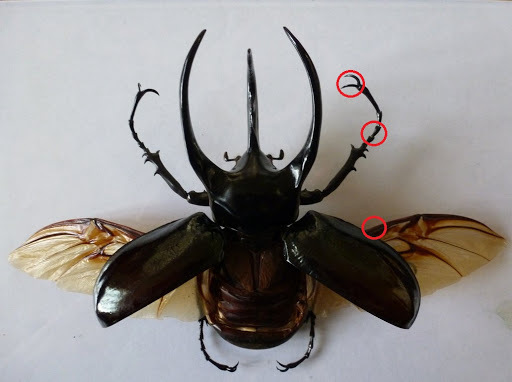 The first stage of repair was to reattach the legs; there were two missing, one beneath the right wing and the right front leg, which was also missing part of its claw (these areas are highlighted in red on the image below). 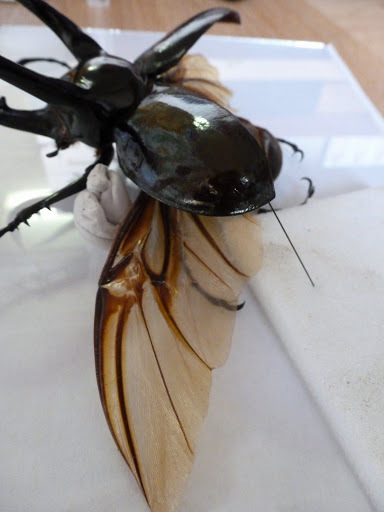 The glue we use to fix insects is of conservation grade and water-soluble; this means that it will not have a detrimental effect on the specimen; it does take longer to dry, but has the benefit of drying clear. Once the legs were secure, the head was attached. Foam was required to form a ledge to raise the head to the correct angle; pins were then used to hold it in place for the two hours it took for the glue to dry. The image below, top shows the positioning required. The final stage was the re-attachment of the elytra (front wings). A similar method was used as for the head, but this time towers of white tack were also needed along with the pins to form full support (below, bottom); because the area of attachment was so small, the weight of the elytra needed to be completely supported while the glue dried. Once the glue had dried clear in all the areas, the specimen was finished and ready to be reframed, as seen below- or not as the case may be as the aim of all repair is to do it in such a way that it should be almost impossible to tell that it has been fixed. The Museums Association (MA) recently held their annual Conference and Exhibition at the EICC. Reported to be the largest gathering of museums and heritage professionals in Europe, it showcases suppliers, hosts workshops and various meetings. Darren Mann of the HEC was there as a speaker to present a talk entitled ‘The Elephant in the Room‘ which tackles some of the difficult questions that are currently being raised about the future of natural history collections in the UK. “Natural history collections are under threat but are vital for taxonomic research, environmental monitoring and education. The main question that is raised by this is- How do we prevent the loss of these collections? 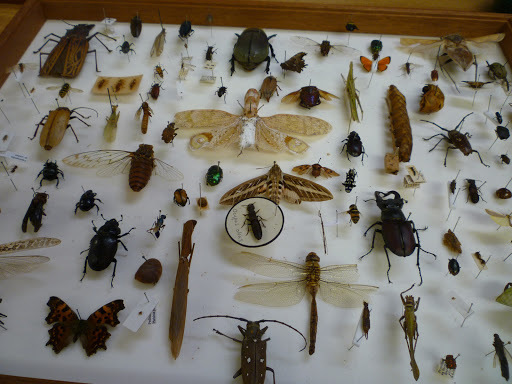 and it is one that is very much on the minds of all natural history curators at the moment as we hear of more collections being ‘moth-balled’ (put away into storage) and the loss of curators through redundancies or down-sizing, leaving many collections without people to care for them, interpret them or make them available for research. The biggest threat of course, comes to the collections themselves which may become damaged or lost altogether through poor storage and lack of care. For example, any item with fur, feather or chitin (e.g. taxidermy mounts or insect specimens) are open to attack from a host of pests including the one most reviled by curators, Anthrenus, which whilst being a rather pretty little beetle, views an insect collection as an assemblage of tasty snacks. 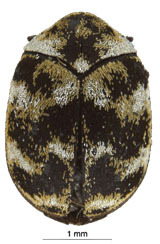 The Varigated Carpet Beetle, Anthrenus verbasci (Linnaeus, 1767). 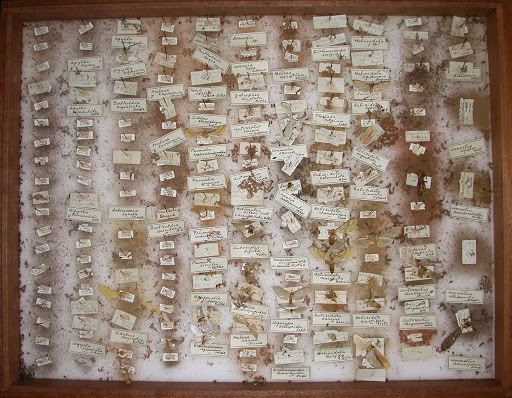 An example of the damage that Anthrenus can cause to an insect collection. This level of damage can occur within 2-4 years of a collection being ‘moth-balled’ if it is not in secure pest-proof storage or being regularly checked by a trained curator. In a round up of the problems associated with deciding the future of these collections, Darren Mann pointed out that despite their huge popularity with the general public there has been a movement in the museums sector away from natural history and towards the arts and social sciences. To put some perspective on this, the Ashmolean Museum recently spent £7.83 million on Edouard Manet’s Portrait of Mademoiselle Claus. For the same amount of money the entire UK entomological collections* of over 10 million specimens could have been re-housed and systematically arranged in modern pest proof storage. The Museums Association will be holding a ‘Vox Pop’ later this week to try and gain some insight into this situation. See the Museums Journal on-line for more information. See here for a wider view on museum closures across the sector. *Outside of National and University Museums. 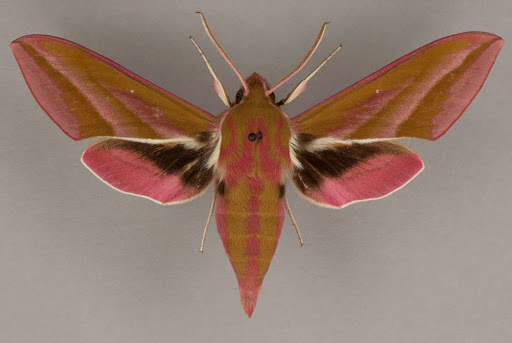 Welcome to our new Entomology department blog! The Oxford University Museum of Natural History (OUMNH) will be closed to members of the public for a year from January 1st 2013 as work is undertaken to restore the glass roof to its former glory. However, behind the scenes, life will be carrying on much as normal. Members of staff from the entomology department will be blogging about what is going on behind closed doors, hopefully keeping people in touch and up to date on news, views and fun things to do with both the department and the wider worlds of museums and entomology as a whole.